Germany V/S Serbia Spectacular Serbian defence tamed high flying Germans. 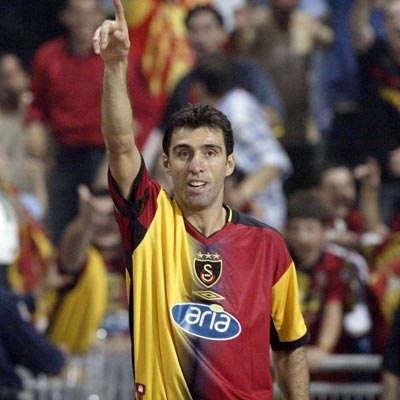 Hakan Sukur is a Galatasaray and Turkish legend. Turkish football fans refer Sukur as “Kral.” He was one of the top European strikers during 90’s and 00’s. Sukur is the current record holder of fastest goal in world cup. He scored at the 10.8th second against South Korea, during the third place match at 2002 world cup. Turkish Football federation adjudged Sukur as the Turkey’s golden player of previous 5 decades. He scored 38 goals in UEFA’s club cup competitions during his career. Hakan Sukur was born on 1st September 1971, at Adapazari, in Turkey. Bull of the Bosphorus is Sukur’s nickname .Sukur started his footballing journey with Sakaryaspor. At an age of 18, he made his Turkish league debut. He scored 10 goals for Sakaryaspor in 38 matches. He won Turkish cup in 1988 with Sakaryaspor. He moved to Bursaspor in 1990.He scored 11 goals for them during his stint with Bursaspor. He won chancellors cup with Bursaspor in 1992.His performances for Bursaspor caught the attention of Turkish giants Galatasaray. Sukur joined Galatasaray in 1992.In his first stint with Galatasaray he won two Turkish league titles during 1992/1993 season and 1992/1994 season. He won chancellor cup in 1995, President’s cup and TYSD cup, Turkish cup in 1993.He scored 54 goals for them during that stint. He moved to Torino FC in 1995.He played only a handful of games for them. He rejoined Galatasaray for second stint in 1995 itself. He played for Galatasaray until 2000, which was a glorious period for them. They won Turkish league in 1997, 1998, 1999 and 2000.He Turkish cup in 1996, 1999, and 2000 with Galatasaray. He won presidents cup in 1996 and 1997 with Galatasaray. He won TYSD Cup during 1998, 1999and 2000 with them. Sukur scored 119 goals during second stint for Galatasaray in 146 matches in his second stint. He was the top scorer in Turkish league in 1997, 1998 and 1999.He won UEFA Cup with Galatasaray in 2000.He was the top scorer in UEFA cup that season with 10 goals. He was in second position for the European golden shoe in 1997 with 38 goals. He joined Internazionale in 2000.However he was not able to recreate his Galatasaray form. He moved to Parma FC in 2002.There too he struggled to score goals. He won copa Italia in 2002 with Parma. He had an unsuccessful stint with English club Blackburn Rovers during 2002/2003 season. He headed back to Galatasaray in 2003 for his last stint. He won the Turkish league in 2006 and 2008 with Galatasaray. He won Turkish cup in 2005 with them. He scored 55 goals during his last stint with Galatasaray, which ended in 2008. He played for Turkish under-21 team in 1993 Mediterranean Games in which they won the gold medal. He played for Turkish Olympics team, Turkish under-16 team as well as Turkish under-18 team. He Turkey entered quarterfinal of European championship in 2000.Even though he struggled to find the form in 2002 world cup, Turkey finished third defeating host South Korea. He scored the fastest goal in the world cup during that match. He scored 51 goals for turkey in 112 matches before he retired from International football. He is certainly most recognisable among all-time Turkish football team players.